Clearing brush is no fun. Sure, swinging a machete on a hot, humid day sounds great, but when you’re sitting in an oatmeal bath the next day because you didn’t see the poison ivy, you’ll be looking for a better way. [RoboMonkey] did just that with a field-expedient brush trimmer that’s sure to help with his chores. This is a hack in the true Junkyard Wars sense of the word. A cast-off electric push mower deck caught [RoboMonkey]’s eye, and a few spare brackets and bolts later his electric hedge trimmer was attached across the front of the mower. With a long extension cord trailing behind, he was able to complete in 10 minutes what would normally take him an hour to accomplish, without spending a dime on either a specialized brush cutter or a landscaping service. The video after the break reveals that it may not be the most powerful tool in the shed, and it won’t likely stand up to daily use, but for this twice a year chore, it’s more than sufficient. And since the hedge trimmer wasn’t modified, it’s still available for its original purpose. Reduce, reuse, recycle – and repurpose. While we haven’t seen many brush cutters before, we seen plenty of mower mods. From LiPo electrics to a gas-powered RC unit, the common push-mower seems to be a great platform for all kinds of hacking. [Ben Ardwin] was asked by a friend to help fix an old motor. It needed a new set of brushes. They’re just thin pieces of copper that mount on the motor housing and contact the commutator. The metal is so thin he thought he’d try fabricating replacements by dissolving copper stock. 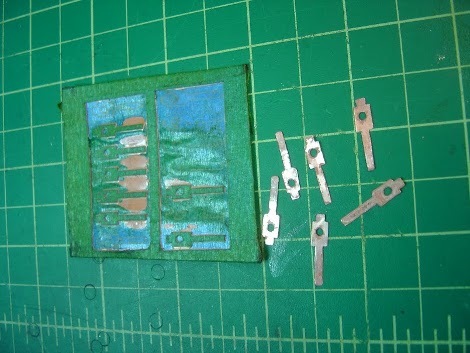 This is not copper clad board; the raw material used in PCBs that has a copper-covered fiberglass substrate. It’s just thin sheets of copper stock. [Ben] started by covering top and bottom with painter’s tape. This will act as a resist for the chemical etchant. He headed over to the laser cutter to remove the tape mask around the outline of the parts. From there it’s into the Cupric Chloride for about two hours. The etched parts are a bit rough around the edges so he cleaned them up by hand using a file. When writing to us about the process he suggests a few improvements. The tape used for masking wasn’t ideal and he would try a different method. He would also remove less area around the parts to help speed up the process. This technique is a really becoming popular as a home-fabrication tool. Recently we’ve seen etched copper used to make a faceplate for an enclosure, and a translucent template for a clock. While hobby brush motors are pretty cheap now adays, there’s always that feeling of why replace when you can rebuild and reuse. As such [John Carr] presents how to change the brush position in motors to revive a dead motor. So long as the motor dies from natural causes commutator wear, the idea is the brushes can be moved along the axes and fixed to a new portion of commutator that’s not worn at all. 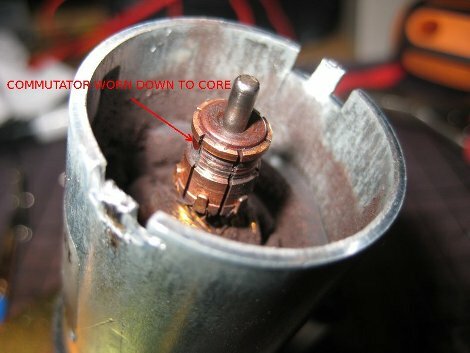 [John] also goes through the details of some tricky reassembly, but we think to make this complete a guide on brush replacement and commutator replacement might be in order hint hint. Here’s an odd little footnote we found while perusing the Comic Tools blog. [Matt Bernier]’s blog is dedicated to drawing and inking tutorials for comic artists. He uses a lot of example photographs that involve both hands. This week, at the bottom of his post on cleaning brushes, he included a photo to illustrate how he takes all of these point of view shots. The camera is strapped securely to his head using an old lanyard. He can see the display and access the controls on the back. After composing his shot, he just sets the timer, and you get a picture of what the process looks like from his perspective. Sure, it looks silly from this angle, but it really helps out the posts.